2018 05 18 pk is all German on my father’s side, half German on my mothers. The remaining half on my mother’s side is British: Engish. That’s the proud half: the Scottish side: a half filled with confusion. My mother’s grandmother was a Turner: of unclear, sort of Scottish blood, an orphan sponsored by Sir Robert Peele. The Turner orphan was ward to the prime minister! And somewhere in there the Turner blood was McPherson. By blood? or by rearing? I don’t know: and don’t much care. My point is to ID radical, passionate origins. The Scots are crazy! 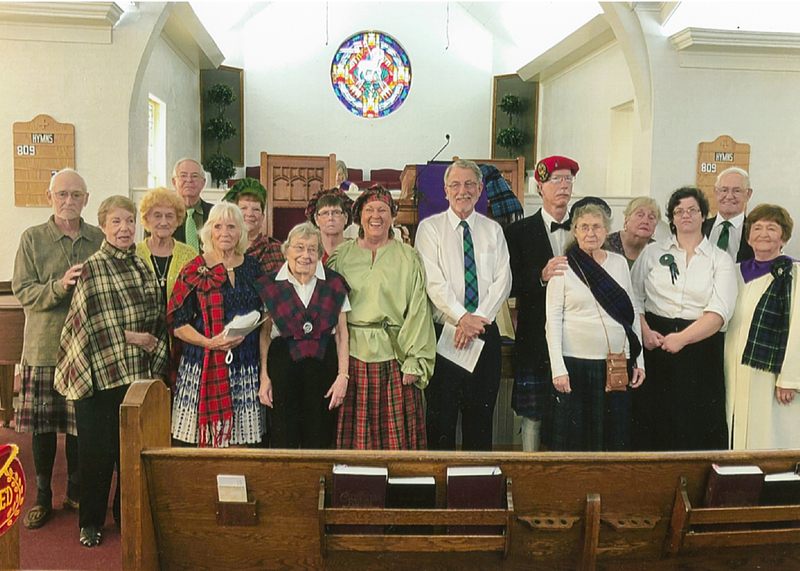 This April Jan and I attended a Kirkin’ the Tartans ceremony: at the First Presbyterian Church in Sebring. Once upon a time Celtic identity threatened the sovereignity of imperial England. Celtic identity, Celtic pride, was sabotaged, forbidden. Scotsman by law could not wear kilts. Remind you of anything? How about breaking up groups snatched from Africa for the slave trade? The slavers deprived such individuals not only of their freedom, but also their families, their tribe: their social puissance: their language. Individuals can protest all they want; if their group identity, their ability to communicate as a community, has been castrated, they’ll be politically helpless as well as individually weak. Ah, but in time, things change. I had my kilt made for me in Edinborough in the late 1950s: or was it the early ’60s? The pattern is the hunting tartan of the McPherson’s. bk loaned it back to me so Jan and I could dress up for the Kirchin’ ritual. A local paper commemorated us with a photo. Braveheart was such a great movie: you didn’t have to have any Scottish blood to think so. I’ve seen it many times: and I think Jan and I are due for another dip. Meantime we just saw Rob Roy: a terrific movie, thank you. We all love Mel Gibson, never mind what an obnoxious idiot he can be. Liam Neeson is our brother, our father, our hero. Please share a perception with me: Look at the globe. Identiry Scotland, Wales, Ireland. Look at Cornwall, at Brittany. Imagine Tristan sailing from Brittany to Coarnwall. Picture Iseult sailing freom Ireland to Cornwall. Now: delete from your mind the map of Europpe: just think “Celts”. Ireland isn’t an island; or it’s all island. The Celts wove their territories together with the sea. The sea was their road.”France” is as much “theirs” as Ireland is! They’re like the Polynesians! land stitched by water. They’re all a short sail away from each other: cousins on both sides of the Channel: both Channels. It’s all channels. We’re born into a world that genuflects toward Rome. We imagine that we’re Christian. We think that people think that Christianity is “good”. Would we think so if Rome hadn’t become the default kleptocracy assigning “education”? When the Roman marched north to conquer “Gaul” they found a continent, “Europe”, full of Celts. They were rich, they had fancy clothes, they had a network of salt mines. If you have salt you can preserved foods on shipboard. If you have salt you can discover “America”. Now, the Romans have no talent for invention; but man are they talented at confiscation: and administration. The Romans didn’t care about Jesus or Saint Paul; the Trinity or if people spoke Latinate languages; the Romans cared who administered the salt mines! England stole Rome’s hegemony England fell on its face: and US took over. Salt mines! salted anchovies! ham! Conquest, there’s no end to it.